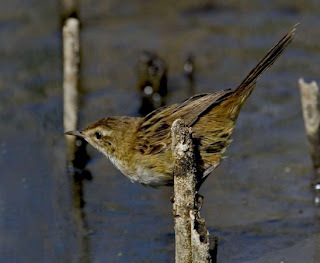 I must plead guilty to ignoring the Tasmanian endemic birds all too often. 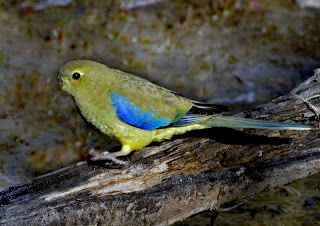 I often mention them in passing, and seeing this purports to be a blog about Tasmanian birds, I must make more effort to show them in all their 'glory'. 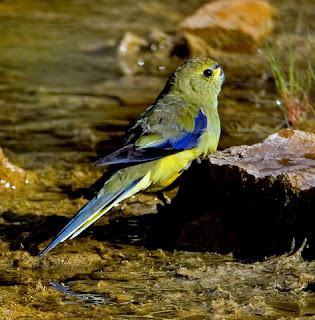 The truth is, many of them are not that showy, and in the parrot stakes, the Green Rosella is not considered to be among the showiest. But a recent brief encounter, made me realise that I might be selling them short. 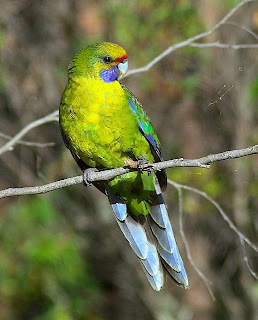 This rosella, the largest of the rosellas, is commonly found in much of the treed areas of the state throughout the year. During the cooler months, some resort to open paddocks and suburban parks, attracted by rosehips, thistle seeds, and similar, sometimes in flocks of 20 or so. ily in the shallow and somewhat murky water, that one of those memorable instants occurred. In the low angle light of the early sun, the individual beads of water that it had splashed onto its back, stood out like diamonds. 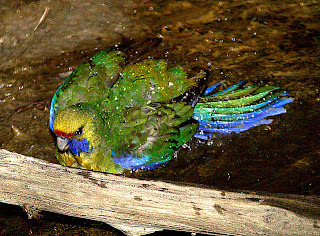 That, coupled with the intense bright blue of the splayed tail, was absolutely splendid. I am usually pretty pragmatic about photographing birds, concentrating intently in recording the moment, but the colours displayed were quite moving. The only downside is that I don't think the image quite does it justice, (or match my rhetoric!). You'll just have to take my word for it. After several minutes watching them peacefully wash and drink, it all came to a sudden, noisy end. 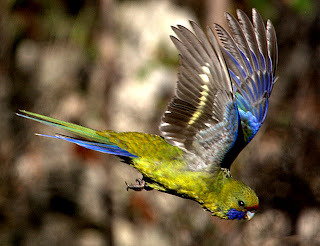 I was aware of a large bird that shot past me, heading towards the rosellas. They shot off in all directions screaming their "cusick" call. The culprit turned out to be an immature Grey Butcherbird, possibly trying to ambush nearby Brown Thornbills, also washing. 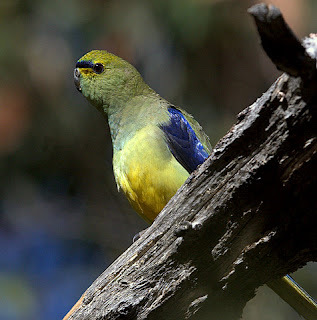 Whatever it was after, it missed, and quickly left, pursued by a female Satin Flycatcher. All in all, another memorable outing. Mona asked the questions "What's the best way to tell apart Whimbrel and Curlew, and where's the best place to see them?" (in comments in the last post). So I've placed a few images here to highlight the differences, largely for the benefit of those birders who spend little or no time watching waders (shame on you!). Curlew on the left, Whimbrel on the right. Looking at them the differences may seem obvious, however, in reality you'll often be watching them from a considerable distance in a heat haze, when it's more challenging. 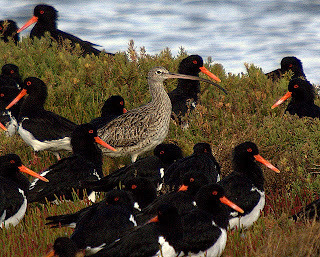 Curlews are considerably bigger, in fact the largest of our migrant waders, and the stand out is the bill length. 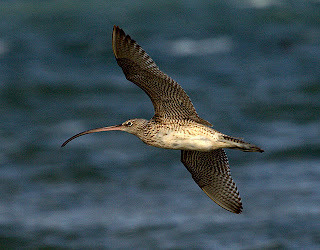 Whimbrel are a similar size to Bar-tailed Godwit, and have their own claim to fame as having one of the most widespread distribution of any migrant wader, being found over mu ch of the World's coastlines. 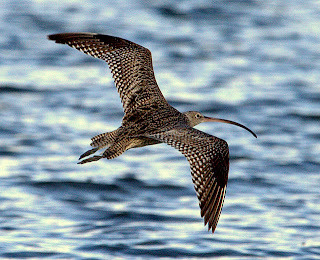 In the South of Tasmania, Eastern Curlew are found during the Summer months, in the Orielton Lagoon, Barilla Bay, Sorell and Five Mile Beach areas. 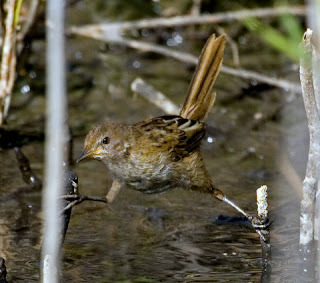 (In the North, the Tamar River in the vicinity of Georgetown is a good spot for both species). Presently there's a flock of around 70 or 80 birds, frequenting the southern areas I've mentioned . A few may overwinter. Whimbrels are a lot thinner on the ground, but occasionally consort with the curlews, notably in Orielton Lagoon. One has been present in Ralph's Bay for many months and is easiest seen there at high tide on the Lauderdale spit, usually roosting with a small flock of Bar-tailed Godwits. You might be lucky and find the curlew there too, as mentioned in the previous post. Once you've found a few of both, I think you'll have little problems in IDing them.